This time of year my wardrobe is overflowing with different coats and jackets for all types of occasions. 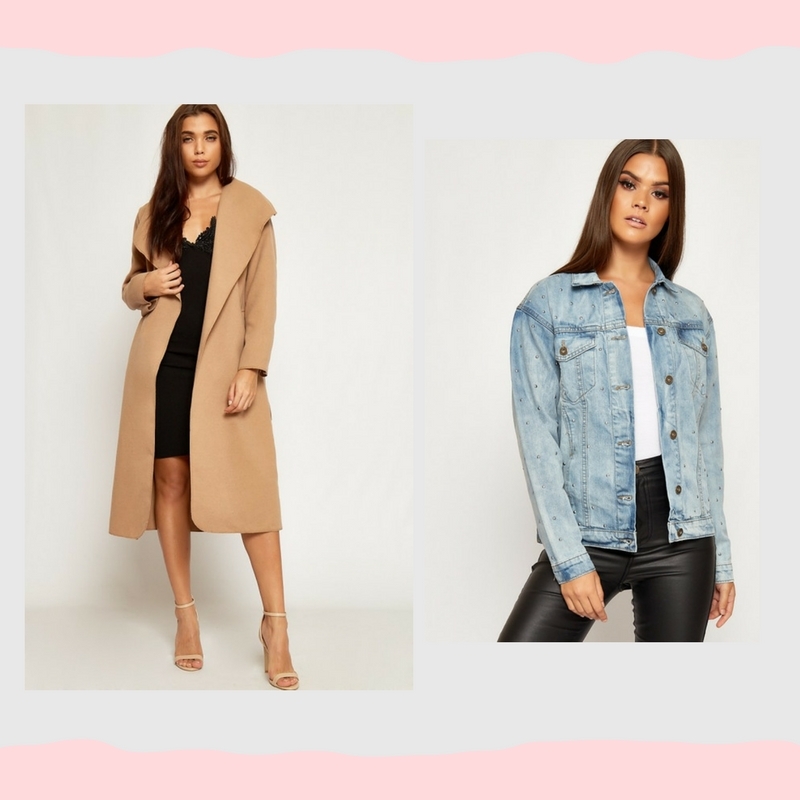 Oversized jackets are all over the internet at the moment, and this beauty comes in six colours including my favourite, camel and is ultra sleek for day and evening wear. A denim jacket is a versatile piece to take you from winter through to Spring and anything embellished is always a winner in my eyes. Can we take a minute to appreciate that we have long sleeved dresses to wear in the winter that are also super stylish! The spotty dress would look fab with black tights and ankle boots for work to drinks and the navy bodycon dress is perfect for date night with the lace detailing. You may think trousers are a work thing, but not anymore! These paperbag style trousers are big news this year and both of these bottoms featured above are guaranteed to keep you a lot warmer than a dress on a night out. I love the fact both of the trousers and jumpsuit have a print and what prints are better than checks and stripes?! You can't talk about winter clothing without mentioning knitwear. Designed to keep you super warm as well as keeping you looking fashionable, knitwear is the trend for everyone and the more detail the better. Pearls and faux fur are two big trends this season that I love! It's all about stocking up on the basics this season to wear under gilets, tucked in skirts and jeans or even to layer under your knitwear to give you that extra warmth when you're out and about. The best part is WearAll have a whole basics category so you really can't go wrong! Which is your favourite piece from WearAll? That blue dress is so nice, but I'd never wear anything like that! I also wanted to let you know that I've nominated you for the Liebster Award Tag on my blog! love the items that you have chosen. But I must admit, I would have the long camel coat at the top of my list - so stunning! I've been hearing a lot about this brand lately and they have some fab items - I am loving their knitwear and that navy dress! Your taste and selection is absolutely amazing. My ears also perk up when I hear affordable fashion lol. The checked trousers, the stripped jumpsuit, the over-sized coat and the blue lace dress, are to die for! I love the look of the faux fur jumper, perfect for winter, it looks so cosy.